Putting the "Art" in "Party"
Both of Toronto's major visual art institutions are hosting social nights with a nightclub vibe, but that's the only thing they have in common. The lobby of the AGO transformed into a dance floor at the first-ever AGO 1st Thursdays event. The rule in some of Toronto’s hipper ‘hoods is that the smaller and harder a bar is to spot, the bigger the lineup and the hype it will have. But beginning last month, two of Toronto’s biggest and flashiest buildings became nightlife hotspots, thanks to two recurring events: the AGO’s 1st Thursdays and the ROM’s Friday Night Live. When the ROM debuted its weekly Friday-night programming last spring, the response was so overwhelming that it was hardly a surprise when a fall season was planned as well. The event series—which features DJs, a dance floor, drinks, food, and special exhibits—began on October 12 and runs until November 30. 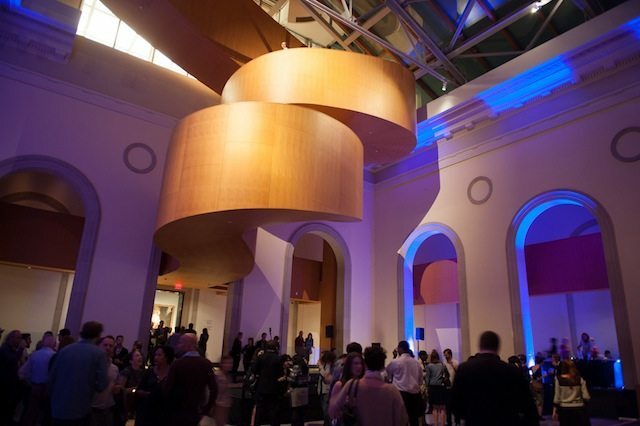 In a similar vein, the AGO is now hosting large-scale parties on the first Thursday of every month. 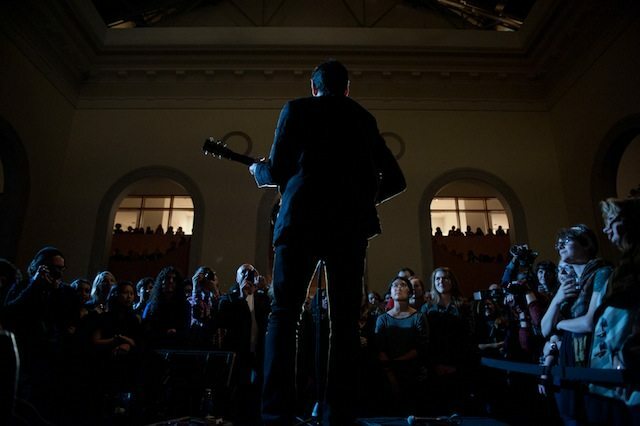 A performance at the first edition of 1st Thursdays. With its less frequent, monthly schedule, the AGO’s 1st Thursdays are larger in scope. They have live entertainment, life drawing classes, and special events designed around significant visual-art happenings. The inaugural event on October 4 featured talks about Evan Penny’s highly-acclaimed “Re Figured” exhibit, with the artist himself in attendance. There was also an acoustic performance by Bahamas. Tickets ($10 in advance, $12 at the door) were in high demand, and the lineup spanned most of the front of the building. The event’s second instalment happens tonight. Stacey McKenzie will announce the 2012 Grange Prize winner for photography, and Toronto’s emerging soft-rock trio DIANA (made up of members of Army Girls and Destroyer) will perform. Both events succeed where normal museum programming fails: they get young people excited about visiting museum galleries. What’s more, they manage to target two distinct crowds. The ROM’s Friday Night Live series is probably Toronto’s biggest, best, and most exciting pre-party for a longer night on the town (it lasts from 7 p.m. to 11 p.m.). 1st Thursdays, meanwhile, is aimed at the art lover. The programs, the vibe, and the choice to have live music all seem pitched to people who might enjoy the rare opportunity to see their favourite art pieces in an entirely new context (i.e., with a drink in their hand).